Available in a myriad colors, effects, shapes and sizes, crystals from Swarovski offer designers a fabulous palette of inspiration and are produced according to the innovative, lead-free* Advanced Crystal standard. Born out of a passion for detail and high-precision cutting, these precious ingredients impart refined glamour to everything they embellish. Swarovski Elements is the product brand for Swarovski crystals in a variety of sizes, shapes and colours. Products that are labelled with this brand guarantee the originality of Swarovski crystals used in creations of international fashion houses and designers. 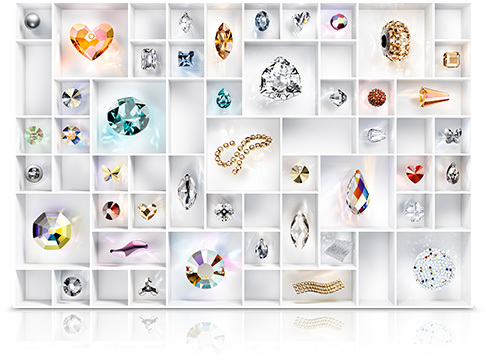 Swarovski Elements are also known as CRYSTALLIZED™ previously. Authenticity can be proven by the seal on the factory package (original package). Certificate of Authenticity (COA) is the package itself. Also, the quality of Swarovski crystal is not mistakable. All original factory packages are marked "Made in Austria." Products in the following categories may require production order because of the large attribute combinations available: channels, crystal mesh, cupchains, fancy multi settings, linked findings, metal buttons & filigrees, metal trimmings, multi stone settings, plastic trimmings, rondelles, single stone settings, and zippers.